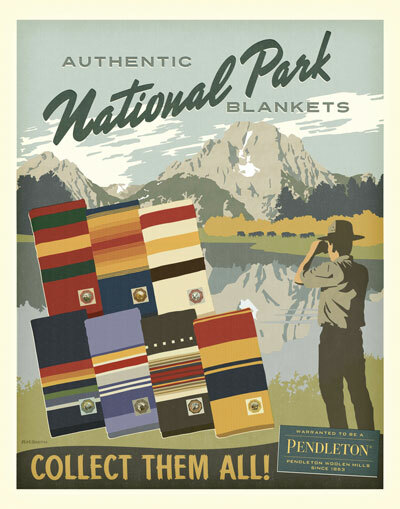 Since the early 1900s, Pendleton has honored our nation’s parks with a growing collection of distinctive National Park blankets. Each blanket is woven in the company’s Pacific Northwest mills and Made in the USA. The newest addition to the Park blanket collection for 2013 honors Badlands National Park, designated a national treasure by President Roosevelt in 1929, and home to one of the world’s richest fossil beds. Deep forest green, golden sunrise yellow, sunset orange and light earthy brown reflect the natural beauty of the landscape with its sharply eroded buttes, pinnacles and spires. The Lakota knew the place as mako sica. Early French trappers called the area les mauvaises terres a traverser. Both mean “bad lands,” no doubt a reference to the rugged and treacherous terrain. The story of how these special blankets began is a true American frontier story. In 1893, the Great Northern Railroad completed its transcontinental route two hundred miles north of Yellowstone National Park, too far away to attract visitors. Railroad President Louis V. Hill tirelessly promoted the establishment of a new national park along his rail line in Montana, leading to the establishment in 1910 of Glacier National Park. In addition to the new Badlands blanket, other parks represented include Yellowstone, Grand Canyon, Yosemite, Rainier, Acadia, Crater Lake and Glacier. 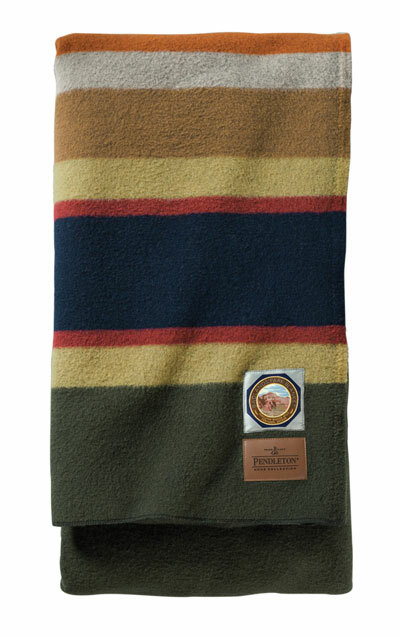 Each blanket bears the Pendleton label signifying its authenticity, along with a special label depicting an image with an important natural feature specific to each park. All blankets are 100% pure virgin wool. The Badlands, Glacier, and Yellowstone blankets are available in Twin, Full, and Queen sizes. All other National Park Blankets are available in Full and Queen only.